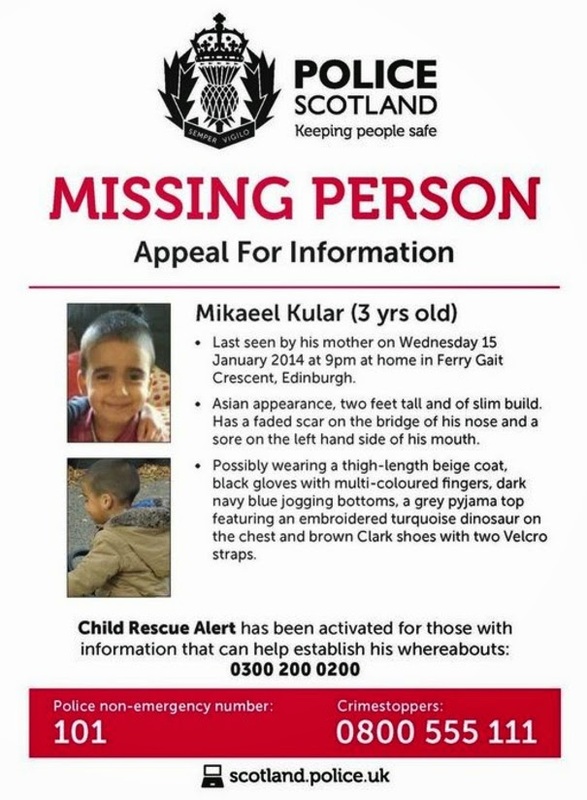 At about 9pm on Wednesday January 15th last year, a three year old boy, Mikaeel Kular was last seen in the house he shared with his mother and four siblings in Edinburgh. He was going to his bed dressed in his PJ’s. By 7.15 the next morning the temperature had dropped to 2.3 degrees outside. 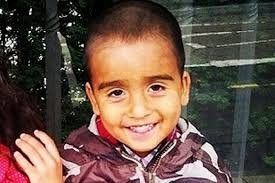 Rosdeep Kular, the boy’s mother, made the terrible discovery that he was missing from his bed. She found a stool pulled over to the front door and deduced that he had climbed up to reach the lock to get out. Two hours later a massive police search was under way. Neighbours heard about Mikaeel and came out to help. A helicopter was scrambled as the police released a picture of the boy with a description of what he might be wearing. It touches the heart, an innocent faced Asian featured boy, with a big smile. He is said to be wearing a beige hooded jacket, brown shoes and blue joggers over his pyjamas. This picture makes every TV news, the late editions of the papers carry it on their front page. People talk, as people do. The Mum’s marriage was in trouble. Maybe the Dad had taken the boy? How many three year olds can dress themselves? Do their own shoes up? How many are strong enough to open the heavy fireproof front doors on a modern house? An hour after that image is released, the police make a statement that there is no suspicion of foul play but they are keeping an open mind. The mother is said to be distraught. Neighbours of the family are asked to search huts and garages, just in case Mikaeel has taken shelter from the weather and got locked in. That afternoon coastguard and lifeboats search the coast. A Child Rescue Alert is initiated so all police forces in the UK are now involved. This allows TV and radio programmes to be interrupted with news flashes. Statements are made in parliament, hoping for a safe return of the child. The police refuse to comment on ‘local intelligence’ that there was a custody issue about the boy. As darkness falls again, more neighbours, the entire community, all emergency services are out looking for the boy as the temperature drops well below freezing. It is now a matter of extreme concern. The search goes on all night. By nine the next morning, the police issue an updated image, showing what he was wearing when he disappeared. By first light the public, the police and all support services, police dogs, horses are all out searching. Family dogs are asked to help. There are over 150 calls to the helpline but no confirmed sightings. 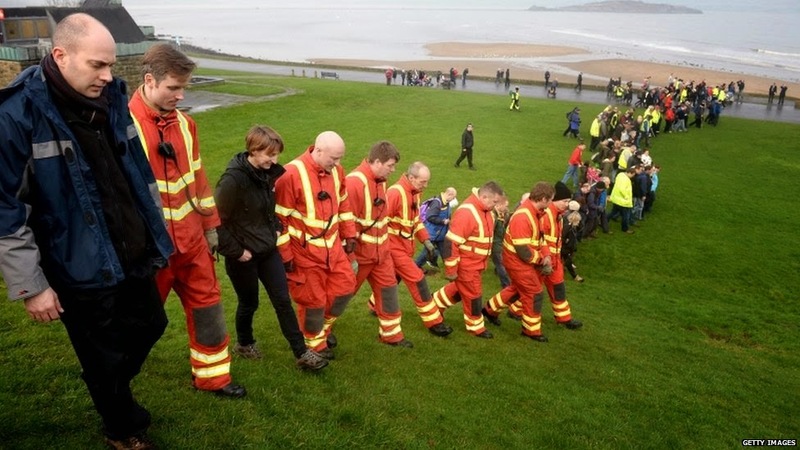 By mid morning, one hundred people are organised into a specific search. Mikaeel's image is prepared to go on billboards and train stations across the country. Meanwhile on Cramond Shore more volunteers, firemen and mothers with prams search the sand and rocks. By late afternoon the Assistant Chief Constable announces that they are now exploring a theory that Mikaeel might have left the flat of his own free will after he became the subject of a criminal act. And the general public were left to fill in the blanks. By tea time it became known that all family members had been traced and talked to. Mikaeel’s timeline was established. It showed that he hadn’t been to nursery since before Christmas because he had been ill. It was now January 17th. A forensic team was seen entering the boy’s house that night. Later that night the police thank everybody who has helped in the searches but say they will continue on their own. There is a sense that the investigation is now targeted and that there will be more announcements. 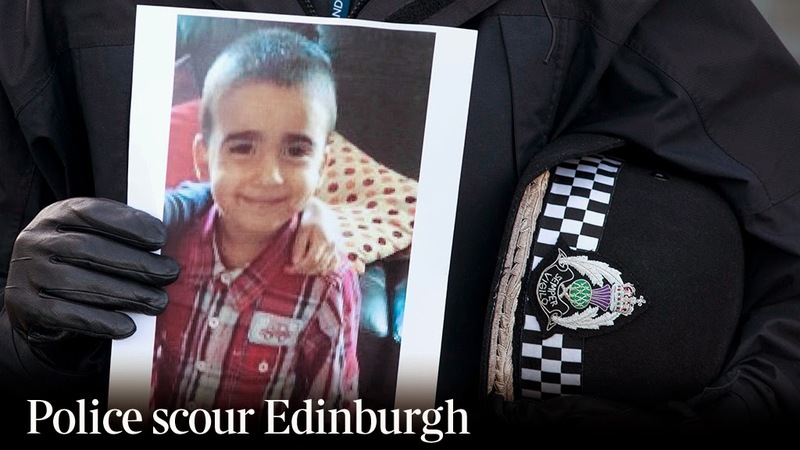 Just after midnight, on the morning of Saturday 18th January 2014, the police announce that they have found a body that maybe Mikaeel’s over 25 miles away in Kirkcaldy, fife. The family have been informed and somebody has been detained in connection with the incident. That person was the boy’s mother, Rosdeep. 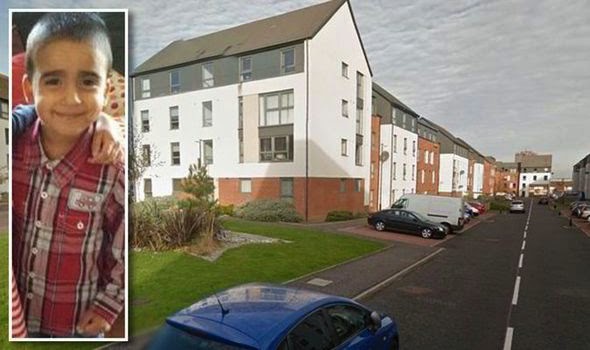 People are upset, flowers and toys are left outside his house and the property in Kirkcaldy. There is a genuine sense of shock. Even for those of us who didn’t really believe the first version of events. 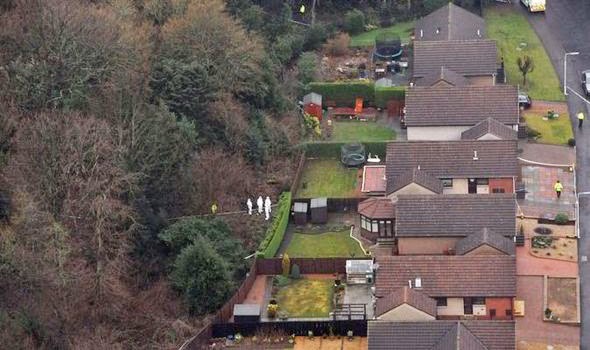 By four o’clock that afternoon, a small body is removed from woodland behind a house in Kirkcaldy. The house is owned by Rosdeep’s sister and Risdee and her five children lived there until 18 months before. One hour later, the police are granted another twelve hours to keep Rosdeep in custody. At seven that night a candle light service is held for the boy, everybody attending holds a candle high in his memory. 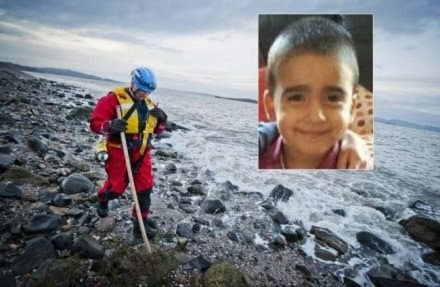 Four hours later, the body is officially confirmed as Mikaeel and his 33 year old mother is arrested and charged in connection with his disappearance. Later she is charged with his murder. His aunt Pandeep, Rosdeep's sister, was 'devastated' by her nephew's death as the forensic search of the wood behind her house continued. 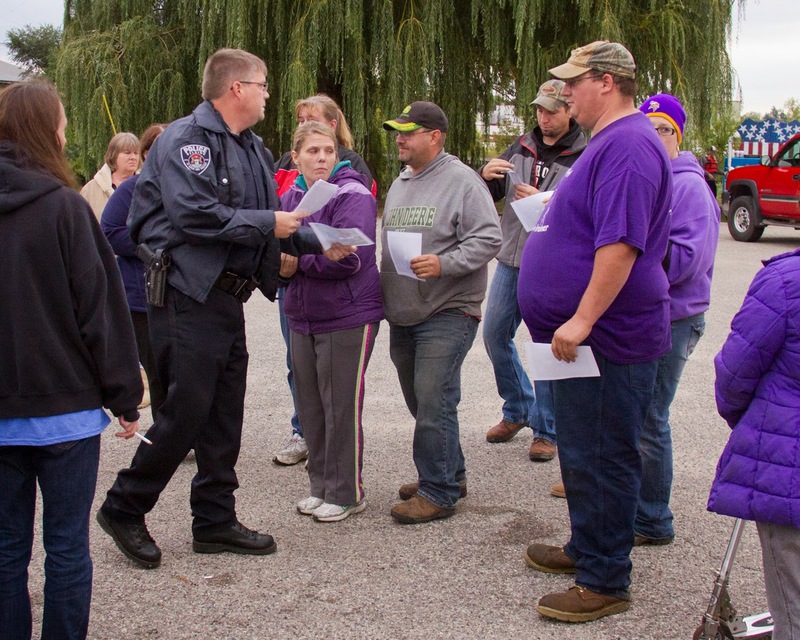 Two things emerged from the community involvement– a sense that they had come together. And a sense that their kindness had been abused. 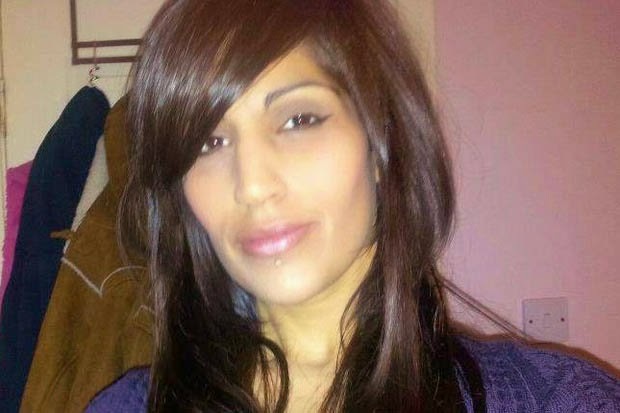 Rosdeep Adekoya was sentenced to 11 years' imprisonment after she admitted killing the boy, wrapping him in a duvet, hiding his body in a suitcase and driving him 25 miles to dispose of the body in woodland she knew well – behind her sister’s house. In the three days prior to his death, he had received injuries bad enough to severely damage his internal organs. He had passed away on the evening of 14 January, probably from injuries inflicted the previous Sunday. The boy had been sick in a restaurant so she had beaten him with her fist, striking him about the body. He was then beaten while laid over the edge of the bath. She couldn’t take him to a doctor because of the bruising and his condition worsened. She found his body on the Tuesday morning, but had the sense of mind to drive his two sisters to nursery before driving his body to Fife. The pathologist found forty separate injuries to his body. The judge said her actions were "cruel and inexcusable". 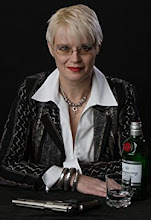 So as crime writers we have gave to ask the question. Why? Rosdeep’s remorse is ‘genuine and heartfelt" She was an intelligent, articulate woman with no history of violence to any of her children. She was in tears all the way through her sentencing appearance. In the end, unable to cope with the pressure, she told the police where to go and get his body. She is a complex lady. Her parents were doctors, her Dad died relatively young. Her mother remarried another doctor. The family are wealthy members of the Asian community. Her five children have complicated parentage. She used to be very overweight, she got a gastric band and reinvented herself as a slim, chick about town. Before that there was a history of depression and, at least one suicide attempt. On social media sites she asked questions about why she loved all her children except one. Why was she so aggressive with only one of her children. And how do you get rid of bruises. Mikaeel's father, who had already another partner and had other children by the time Mikaeel was killed, says that Rosdeep, Rosie as he called her, never got over their break up and resented the child because he looked so much like his father. That relationship was disapproved of by her family. Rosie, the ‘dancing queen’ became a social butterfly after her marriage broke down and it seems to me, she began to live life the way teenagers do. She hung about night clubs with friends of dubious character. Despite having five kids under the age of ten she set up her own beauty business then continued with her love of partying. Her facebook page was full of photos of her enjoying the night life. Including one friend who later died in a shooting incident. The parents of her estranged husband always had reservations about her party lifestyle. Her husband tried to curb her behaviour, she objected so he left and believed that Rosie had moved on to another partner. He divorced her on Christmas day 2014. It seems a sad tale for all involved. Little Mikaeel paid with his life. A father has lost his son. His siblings will grow up knowing that their mother killed their brother. But you can’t help thinking that somewhere in there was a woman crying for help, or trying to be somebody she wasn’t. Trying to live a life that she thought she should have had. Like I say, sad all round. This case also reached Norwegian news media, but without the drama and insights presented here. 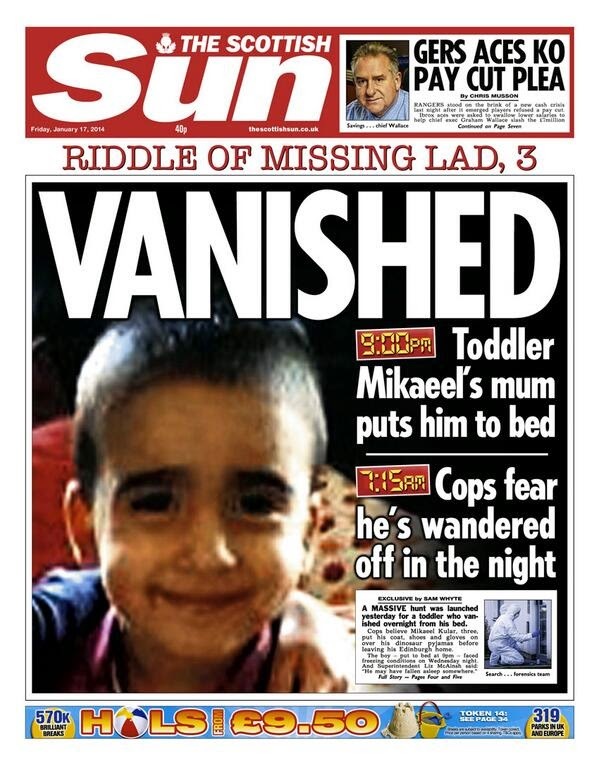 He disappeared from his bed, said Norwegian newspapers. Several thousand volunteers searched for him and after a short week he was found in his aunt's cottage and his mother were arrested. What actually happened has not been referred, and we will well anyway never know. Some contemporary crime writers might say that even if we knew just what happened, the question of why will remain forever elusive. Ruth Rendell's later books are no longer the quasi-case-histories some of her earlier books were. Case histories assume the answer to why is within reach. Nothing upsets me more than violence against children. No doubt the mother in the is story is more mentally ill than evil, but that does not exonerate her in my mind. And the father--who knew she was unstable--left his son with her and went off with another woman? Does he feel no remorse for not protecting the child? The aunt? She did not think to intervene? We developed as a tribal species. We should never shut our doors to what is happening to the children (in this case a baby) in our midst. This is dreadful. Just dreadful. It makes one wonder how the mind works, or doesn't, in such a person as Rosdeep. Such a sad story. Precisely when did Scotland do away with the death penalty? I know, 1965. Happy 50th Anniversary. I find that third verdict, not proven, to be a very fascinating aspect of Scottish criminal justice. There are books that collect stories that concluded with verdicts of not proven. I don't know if that verdict is still used. Caro would know. 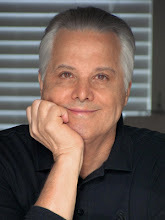 There are, unfortunately, so many cases like this one: Susan Smith, Diane Downs, Alice Crimmins. The Andrea Yates case raises many questions. She said the devil made her do it, unlike the other mother who stoned her children and said God made her do it. The jury took that to mean Andrea knew she was doing wrong. Of course, she later got another trial. About Annamaria's comment, I would like to note that we have no thermometer for distinguishing crazy from evil. I once wrote a blog on this subject for Poisoned Pen Press. Was Medea evil? Like Annamaria, I am sickened by violence against children. Unfortunately, infanticide has a long and complicated history. Oedipus was shocked not only to learn what he did about himself but by learning his mother was willing to have him killed. Caro you tell this story very well. Caro does tell it very well. The real heartbreaker for me is that others stand by and do nothing. The father and the aunt of that poor dead child are not considered evil or crazy. What should we call those who see the problem and fail to defend an abused child?